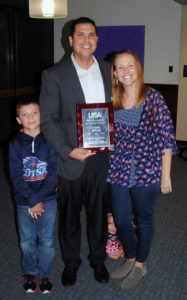 Chris Rosas, ’00 MBA ’02, was named the Outstanding Accounting Alumnus of the Year by the UTSA College of Business Department of Accounting. Rosas is the vice president of global tax and treasury at Rackspace, where he has worked since 2010. He began his career with Clear Channel Communications and rose to the position of international tax manager. Later, he joined PwC where he spent four years as international tax manager. “Chris has excelled in the international tax industry and is an influential and accomplished professional who is well respected in the business community,” said Wm. Gerard Sanders, dean and Bodenstedt Chair in the College of Business. Known as one of the Roadrunner Rackers, he started the accounting internship program at Rackspace and has been known to hire UTSA accounting interns. In addition to his professional accomplishments, Rosas is an active supporter of UTSA. He served as a member of the Alumni Association Board from 2011-2014, and he is a member of the Accounting Advisory Board since 2014. Through his work with the Department of Accounting, he has been a member of the Kathleen Keil Golf Tournament planning committee, and he has participated as a mentor with the board’s mentorship program. The UTSA Department of Accounting recognizes the accomplishments of accounting alumni by awarding the Outstanding Alumni award each year. Individuals are chosen based on their career accomplishments and their active participation and support of the department, college and UTSA.